Former President George H.W. Bush has been admitted to the intensive care unit at a Houston hospital to "address an acute respirator problem stemming from pneumonia." The 41st president was admitted to the Houston Methodist Hospital on Saturday for shortness of breath and was responding to treatments. The 92-year-old is apparently in stable condition and "doing fine" according to his chief of staff, Jean Becker. His wife, Barbara Bush, was also admitted to the hospital as a precaution after experiencing fatigue and coughing. The couple already informed President-elect Trump in a January 10th letter that they would not be attending the inauguration in Washington, D.C., this Friday due to their health concerns and wished him well. "My doctor says if I sit outside in January, it likely will put me six feet under. 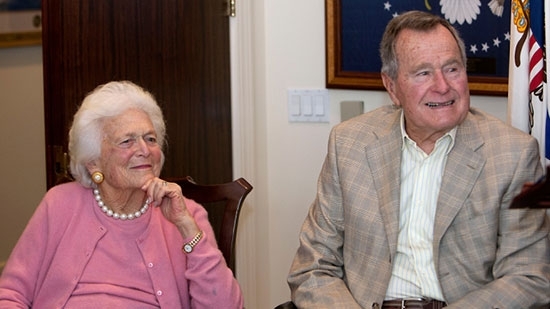 Same for Barbara," Bush wrote, "So I guess we’re stuck in Texas." New Jersey Governor Chris Christie addressed his lack of role in the incoming Trump administration today. The Republican appeared on NYC sports radio WFAN's "Boomer and Carton" show on Wednesday morning. Christie said that he was offered several jobs but nothing he "thought was exciting enough for me to leave the governorship and my family." His wife, Mary Pat, has apparently made it clear that she does not want to move to Washington. The couple also has two teenage children still at home and in high school. This is the final year of Christie's governorship. Trump told The Wall Street Journal, "at some point, we're going to do something with Chris." Philadelphia Police are looking for two suspects wanted for robbing the Verizon Wireless store on the 300 block of South Street earlier this month. The two men were caught on surveillance tape entering the store at 322 South Street around 3:45 p.m. They immediately walked over to some cell phones that were on display and grabbed them. As soon as both men tried to run, they both slipped and fell hard on the slick wood flooring. They then got up and fled out the door. Anyone with information about the suspects is asked to contact the Philadelphia Police South Detective Division at 215-686-3013/3014. you can see the surveillance video below.